I noticed that a lot of my peers were drawing their own alphabets...and getting into type design out of necessity. Riley Cran discovered the Dribbble community in late 2010 and was soon connected to a network of like-minded designers. He took notice of Tyler Galpin’s lettering projects and the two soon became friends with a shared interest in type design. In January 2011, they were chatting about their love for mid-century script logos and studying the same vintage advertisement when they noticed a tall condensed sans serif that read Muncie, Indiana. Riley told us, “It was a font that most likely was never a full alphabet and was lost in time. So we wanted to recreate it. We dared each other in the moment. I bet Tyler I could draw it up in a day, and Tyler said if I did, he’d built a site to distribute it.” Twenty-four hours later, the Muncie alphabet was complete, they released it on their site as a free font, and they became co-founders of Lost Type. 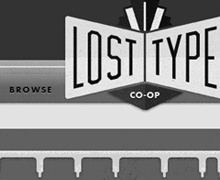 Now, only a year after they launched the site, The Lost Type Co-Op is a thriving pay-what-you-want font foundry that offers nearly forty fonts. The optimistic business model is paying off and Lost Type is a thriving marketplace. Their fonts have been used in ads for ESPN, the NBA, Nike, the Obama campaign graphics, and in work by numerous independent designers around the world. You can view more fonts-in-use examples on the Lost Type blog. The co-founders enjoy collaboration with their peers and have recently opened a Lost Type store to help support the foundry. Riley is passionate about historic industrial design, the impact of the “father of industrial design,” Raymond Loewy, and engaging the design community at large. Be sure to check out Lost Type and download some quality fonts for your next project!